For the longest time, I wouldn’t eat mayonnaise. I knew that the store-bought version was no good for me, but I was afraid to try making my own at home. 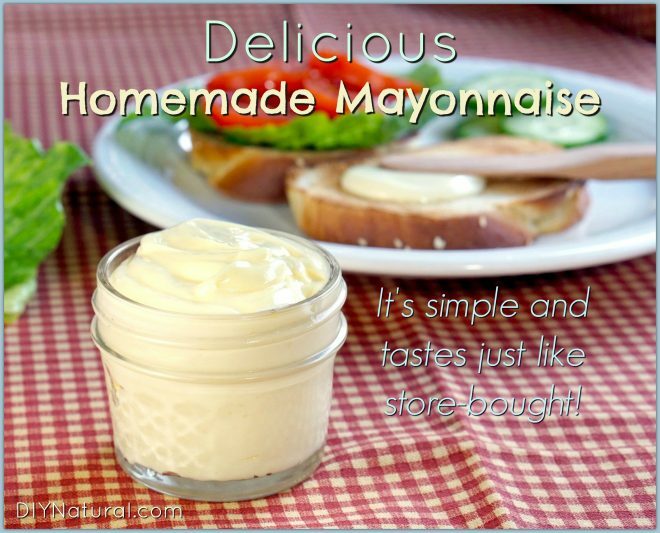 Once I finally tried making homemade mayonnaise, I was amazed at how easy it was. In five minutes you can have creamy, flavorful mayonnaise for spreading on sandwiches, mixing into pasta and potato salads, or even for topping grilled summer burgers. And, while it’s definitely not a health food, homemade mayonnaise is full of healthy fats and protein, which means you don’t have to be afraid of mayonnaise any more! The main ingredient in mayonnaise is oil. While you typically can’t pick out the subtle flavors of oil as you’re using it for cooking and baking, in mayonnaise the oil is such a major player that its flavors are front and center. Obviously, we want to use a healthy oil, and olive oil is a go-to healthy oil in our kitchen. But, when it comes to mayonnaise, the olive flavor and slight green tinge of Extra Virgin Olive Oil make it hard to re-create that classic mayonnaise flavor and feel. Thankfully, there’s a solution for that: Extra Light Olive Oil. If you find yourself in the oil aisle in the grocery story, you will likely come across three main types of olive oil: Extra Virgin, Pure, and Extra Light. So, what’s the difference? Extra Virgin Olive Oil (EVOO) is made from the first pressing of the olives. This oil has the most olive flavor and is great for salads, bread dipping, and even in pizza crusts and focaccia. Pure Olive Oil goes through an extraction process and contains less olive flavor than EVOO. It is great for grilling, roasting, and sautéing. Extra Light Olive Oil isn’t light in the calorie sense. But, it is light on olive flavor. This makes it perfect for baking sweets and for making mayonnaise! Mayonnaise is made by creating an emulsion, which is a mixture of two things that would typically want to stay separated. In this case, the two items are the egg yolk and the oil. The trick to getting these two ingredients to play nicely together is to add the oil VERY SLOWLY while mixing. I prefer to make my mayonnaise in a food processor and pour the oil in using a liquid measuring cup. I start off adding a few drops at a time, and then, as the mayonnaise starts to thicken, increase the amount of oil to a slow stream. This method hasn’t failed me yet. But, some people like to use an immersion blender or even whisk their mayo by hand. Either way, the trick is to make sure the oil gets added a little at a time while mixing. Place the egg yolk, salt, and vinegar into the bowl of your food processor. Put your oil into a 1 cup liquid measuring cup or another container that is easy to pour. With the processor running, slowly pour in the olive oil, starting with a few drops at a time and continuing with a very slow and steady stream. As the mayonnaise begins to thicken, continue pouring, slowly, until all of the oil has been used. Once the mayonnaise is thick, slowly blend in the lemon juice, until incorporated. Use the mayonnaise immediately or store it in a sealed container in the refrigerator and use within a week. Now that you have homemade mayonnaise, you will want to put it on everything. Trust me. I love mixing it with my homemade ranch seasoning mix to make a homemade ranch dressing. It is perfect for mixing into summer potato salad or creamy coleslaw. And, yes, it even makes a wonderful addition to a grilled burger. I also ad some boiling water when done It prevents the mayo from separating and maybe sterilizes the egg…about maybe 1/4 c…or less add slowly and beat at same time…a french chef taught me this about 55 yrs ago..
Hi Stephanie. What an interesting method! I’ll have to give that a try next time I make it. Thanks for sharing! How much mayo does this recipe make? Once summer comes, we’ll use enough that we would use a cup or so a week, but not quite yet. Hi Bethany, The recipe makes 1 cup of mayonnaise. I hope you enjoy it! Will this work with Apple cider vinegar? Hi Tina, You definitely could use apple cider vinegar. I like white wine vinegar because of the light flavor it gives the mayonnaise. Apple cider vinegar will give a different, sweeter, and stronger vinegar flavor. I would probably start with 2 tsp of apple cider vinegar (rather than the 4 tsp listed in the recipe) because of its stronger flavor. Give it a try. You might find that you like the flavor of apple cider vinegar better! Mine is still liquid-should I keep going or is it failed? Hi Karen, You’re probably experiencing a “broken” mayonnaise. This happens if the oil is not added slowly enough. To fix it, transfer all the liquid into a separate container. Place a new egg yolk in your food processor and, with the processor running, very slowly add your broken mayonnaise to the egg yolk. If you’re worried that you can’t pour slowly enough, use a teaspoon to add just a little at a time. After the mayonnaise starts to thicken, you can increase the amount of liquid you add to a steady stream. Thank you Sarah! Will give it another try! My grammy taught me to cook when l was 5 years old. One of the things we made was homemade mayo, I grew up in the mountains of SW Virgina and we didn’t have blenders or food processors back then. (I’m 72) I didn’t even know you could buy any type of food in a store back then. We made homemade mayonnaise by beating with a very old wire whisk, the oil was rendered from the fat that we saved when we butchered the hogs or a beef. We also made our own mustard from wild mustard flowers. Karen, I am so sorry to hear that the recipe isn’t working for you. Mayonnaise is a tricky thing because you are trying to blend things that typically don’t want to blend well. It is difficult to say what went wrong in your case, especially since it turns out fine for me. But, after reading your comments, I have been doing some research about what may cause mayonnaise to not thicken. I’ve decided to tweak the recipe instructions slightly so that the lemon juice is added after the mayonnaise thickens. This should help the emulsion to come together initially, and once it is stable it shouldn’t break. Thank you for your feedback and hopefully this adjustment helps. I got it!!!!! I put two egg yolks in a bowl and used a wisk and added very slowly. So excited it worked! Thank you! Wonderful Karen! I’m so glad to hear it worked for you! I’ve been wanting to try this. I recently got a Ninja blender which is out of this world and I think it would do a great job on this. I’ve heard home-made mayo is even better than store bought. I agree with other commenters that some store bought mayo is really good…I love mayo…but I would feel much better eating clean mayo with good ingredients. I don’t worry about raw eggs because I have chickens in my back yard that give me healthy (unlike factory eggs) little gifts every day. Thanks for the very nice article. Are there any worries with the raw egg? Hi Lisa, While there is always a small risk, the chances these days of getting salmonella from raw eggs is very small. The risk is even smaller if you are getting good quality, fresh, pastured eggs from a clean, local farm. If you are concerned about using fresh eggs, you can always look for pasteurized eggs. The pasteurization process would kill any bacteria. Hi Lara. Thank you! If you want to use an immersion blender, I would recommend using a deep but narrow container, like a wide mouth pint jar or a 2 cup liquid measure. If your blender came with a blending cup, that would be perfect too. And, yes, the key is making sure that the oil is added slowly, a teaspoon or two at a time as you start. Once you have used about 1/2 cup of the oil, it will be more stable and you can pour the oil in more of a slow, steady stream. Enjoy! I have found that with an immersion blender, I can just put all of the ingredients in the jar (I use a wide-mouth quart jar), immerse the blender all the way to the bottom of the jar and then very slowly (while it’s on) draw it up to the surface of the ingredients. This way is pulls only a little bit of the oil in at a time, and works like a charm–very fast and very easy! Also, I sub half melted coconut oil (expeller-pressed) for half of the olive oil, and I like to use a bit of white pepper (maybe 1/4 tsp) and about the same of smoked paprika. I also add a tablespoon or 2 of honey or agave to our mayo once in a while. So good! Thanks Liz. Good to know this method works well! Do you find that the coconut oil changes the consistency of the mayonnaise when it is refrigerated? Hellmen’s mayonise is so Good!! I love making homemade mayo. I use half EVOO and avacado oil. This works very well for us. That sounds like a great combo Kelly. Thanks for sharing! why would you make a mayonnaise that taste like store bought ,when they are all pretty awful? Nothing beats home made mayo! I disagree. Hellman’s is so good I could spread all over my body! Yes, Hellman’s tastes good and it is more convenient but it is full of unhealthy ingredients. I do not consume eggs. What do you recommend for that, in general? Hi VP. Unfortunately, eggs are a pretty key ingredient to help thicken mayonnaise. Some people do make a egg-free mayo substitute with avocados or use other thickeners as a replacement, but the results seem varied. It might just take a bit of trial and error to find a recipe that works best for you. Perhaps one Tbsp of ground chia seeds, soaked in 1/4 cup of water, would be a decent substitute for the egg yolk. Chia thickens up nicely this way and may work. I’m just guessing.